Also I found out that the palette/look can be replicated as the colors are available in the permanent collection. From top to bottom the colors are Refresh Eye Brightening and Setting Powder, Rose Champagne, Nutmeg and Bourdeaux. I used Laura Mercier’s Eye Basics in Wheat to prep my lid and Le Metier de Beaute Dualistic Eye Pencil in Champagne as base. 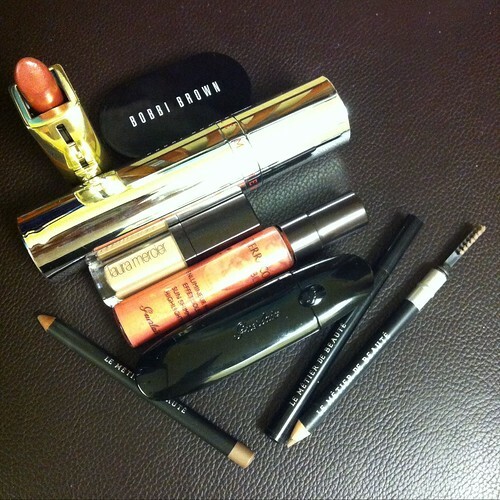 Using Le Metier de Beaute’s Eyeliner Brush, I patted Refresh all over the lid from lash line to the brow bone. Followed by Rose Champagne and Nutmeg on the lid. I patted Bourdeaux closer to the lash line and blended upwards. 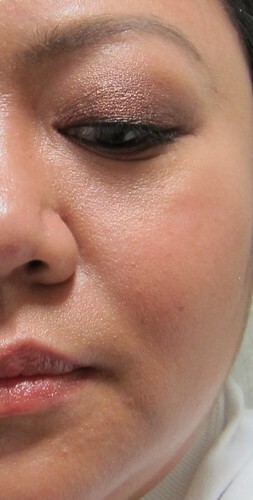 Next I blended the crease using wiper motion to blend out the harsh line then highlighted the brow bone with Refresh. Next I applied a very thin line close to the lash line using the Precision Eyeliner in Noir then applied mascara. Fawn is a lot lighter than our coloring but when applied, the brows just appears slightly darker than usual but well shaped and groomed. I like Mikey’s way of doing it. Brush down the hairs, outline the upper outline of brows, brush up line the lower outline of brows, just fill in between then brush up and outwards to blend. The other colors are way to dark for me as I do not like dark brows. I hope that helps you. Very helpful. Fawn it is then. Have a nice weekend!